The CSU/DSUs on each end of a T1 link apply framing logic to the serial data stream in each direction on the link. The framing process allows a device to identify the individual DS0 channels, as well as overhead bits. The overhead bits are used for synchronization and framing, management, and a CRC error check. T1s use either the older Superframe (SF, also known as D4) framing standard or the Extended Superframe (ESF) frame format. E1 lines use either the ITU G.704 or G.706 standard. 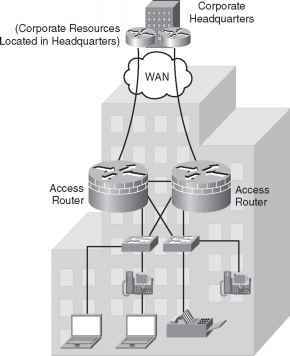 Using a T1 line, the telco could install a T1 circuit to the customer facility, and then via configuration decide how much bandwidth to provide to the customer as a multiple of the 64-kbps DS0 channel. With a physical T1 installed, the CSU/DSU on each end could find the individual DS0 channels. If configured to use only specific DS0 channels, the link would be a fractional or subrate T1. Alternatively, if the full T1 bandwidth is needed, the CSU/DSU can ignore the DS0 channel boundaries, treating all non-overhead bits as a single serial data stream. The devices attached to the T1 line must conform to the same framing standard and the same line-coding standard. The line coding defines the electrical characteristics that imply a 0 or 1 on the link. Figure 17-1 shows a comparison of the two popular encoding standards used with T1s, namely Bipolar 8 Zero Substitution (B8ZS) and Alternate Mark Inversion (AMI). AMI and B8ZS use similar rules for encoding 1s and 0s. 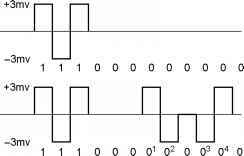 Both standards use a 3-millivolt (3mV) signal to encode a binary 1, with each binary 1 alternating the polarity (current) to avoid inducing a DC component. For binary 0, no voltage is used. B8ZS differs from AMI when eight consecutive 0s occur in the data stream. Long sequences of 0s, meaning 0 V on the line for the duration of the consecutive 0s, result in no signal transitions. Signal transitions are needed to maintain proper clock synchronization. To create signal transitions, B8ZS sends an alternative sequence as shown in Figure 17-1, using Bipolar Violations (BPVs), to represent eight consecutive 0s. (BPVs exist when a 3-mV signal has the same polarity as the previous 3-mV signal; Figure 17-1 points out two BPVs.) Instead of 8-bit times with no signal, B8ZS sends what looks like three 0s, one BPV, a valid 1, a 0, another BPV, and then another valid 1. However, the receiver then converts this sequence as a string of eight 0s, because it knows that this sequence has occurred because of the B8ZS line code rules. Because B8ZS uses BPVs to correctly encode bits, not all BPVs result in an actual bit error. However, AMI does not use the BPVs to encode eight consecutive 0s, so BPVs would always indicate some incorrect line encoding—that is, a bit error. Table 17-2 summarizes the key features of DS1 standards.